We’re excited to announce that we’ll be featuring planning posts from a newly-engaged and very special bride-to-be: Steph!! We’re kicking things off today with an inspiration board I made for her. Identifying a set of images around a common theme or “feel” is a great way to begin your planning process, as it will help you narrow down the lists of venues and vendors with whom you’d like to work. I am thrilled for Steph and looking forward to featuring her and her fiancé as they move through the planning process and closer to the start of their lives as a married couple. Steph said she wanted colors that felt appropriate for an October wedding, but didn’t want oranges or browns, preferring purples and reds. Steph and her fiancé both liked the idea of something more relaxed than a ballroom wedding, and given that my sister loves Italy and vineyards, I took that as my inspiration point. I’ve included two tables in the board: the navy tablecloth in the lower right and the white tablecloth in the lower left. The candles and greenery runner, or candles and flowers, would work with either, just as the purple and green accents would. The white table image is a bit lighter and softer looking, in part because of the chairs and chair pads, whereas the navy table image feels a bit moodier and rustic, given the dark foliage and the wooden chairs. 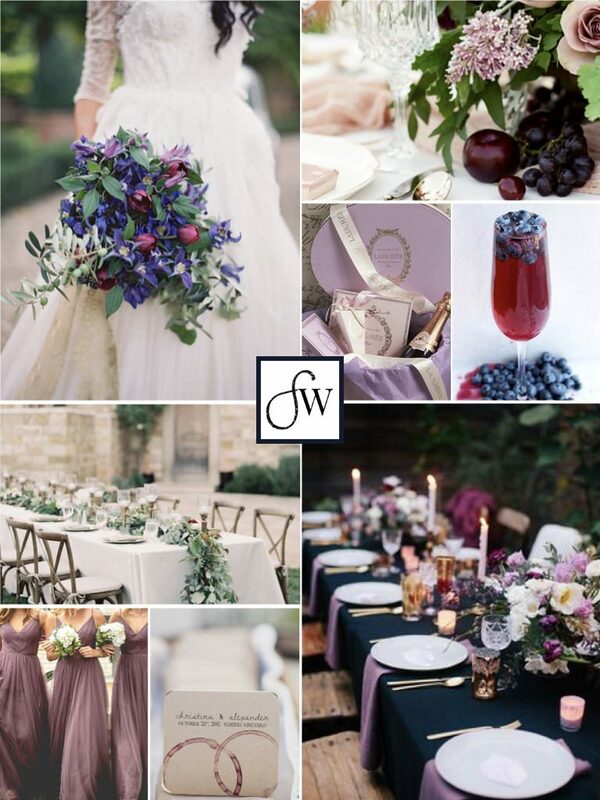 Most of the images I found while putting together this board had an organic feel: the looseness of the bouquet and the table runner, the softness of the chiffon dresses, and the inclusion of fresh blueberries and plums all contribute to the overall softness. A very ornate, tightly bundled bouquet, for example, wouldn’t have the same effect. An outdoor courtyard with long tables, or a building with light-colored stone (as in the white table photo), particularly with lots of greenery, can evoke the feel of a French or Italian vineyard. Candles will add to the ambiance, and lights (whether overhead or in trees) would do the same. Serving delicious food and wine helps, too, of course! Are you considering (or have you already had) a fall wedding? What colors did you choose? Let us know in the comments!